As high-performance personal audio systems have evolved, they have become more specialised. Some focus on top class headphones and electronics intended for use within the relative quiet of one’s home, while others centre on advanced, high-performance universal fit earphones, CIEM’s, and associated portable components that can be enjoyed either at home or on the go. For a systems-orientated issue of Hi-Fi+, we decided to configure a multi-part personal audio system that not only offers some of the best headphone and earphone sound around, but that also offers exceptional versatility for in-home and portable listening applications. Our system is comprised of four components: the iFi Audio Pro iCAN hybrid valve/solid-state fully balanced headphone amp/preamp (Hi-Fi+issue 143); the Chord Electronics Hugo 2 transportable headphone amp/preamp/DAC (Hi-Fi+issue 153), the Final D8000 planar magnetic full-size headphones (Hi-Fi+issue 157), and the Campfire Audio Andromeda universal-fit earphones (Hi-Fi+issue 158). These components are strong individual performers, but also harmonise beautifully with one another as a group. Let’s look at each component in turn and then talk about the synergies between them. At a recent personal audio show an industry colleague told me he was considering purchasing a Pro iCAN. “I’ve searched all over the personal audio market space and I haven’t found any amp that offers the sound quality or versatility that the Pro iCAN does,” he said. “Have you found anything that tops it for around the same amount of money?” After scratching my head for a moment, I had to admit my colleague was right. iFi’s Pro iCAN is that rare product that combines exceptionally high baseline performance plus an expansive set of useful features and functions unmatched at or even above its price class. 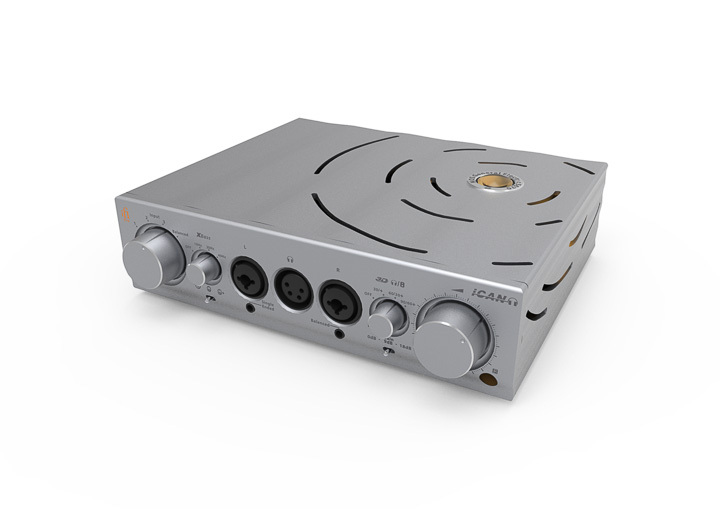 The Pro iCAN is a powerful yet also quiet balanced headphone amplifier/preamp. Significantly, it offers three operating modes: Solid-State, employing a Class A discrete J-FET circuit; Tube, employing a Class A valve-powered circuit with moderate negative feedback; or Tube+, employing the same Tube circuit, but with feedback reduced “to a minimum”. Users can switch between modes on the fly to choose the mode(s) best suited to one’s headphones, earphones, or listening tastes. Pro iCAN also provides switch selectable gain settings of 0dB, 9dB, and 18dB. I tried both systems at some length and found them admirably subtle and restrained in their effects and useful when applied in appropriate contexts. With that said, however, I left the circuits switched off for most of my headphone listening to better appreciate the rich, pure, and unprocessed sound of the Pro iCAN. Predictably, the sonic character of the Pro iCAN is determined by the operating mode chosen. As a rule, the Solid-State mode yields the tautest presentation with excellent linearity (that is, neutral tonal balance), quick and lively transient response, and crisp, sharp focus. Switching to the Tube mode gives similar linearity with a very slightly more softly focused sound, but with more vividly rendered tonal colours, superior harmonic richness, and even more expressive dynamics. Finally, the Tube+ setting is like listening to the Tube mode on steroids, meaning that, on the right track and with the right headphones, the Tube+ setting is positively enchanting. When I used the Pro iCAN with Tube+ mode engaged to play the title track of Mary Chapin Carpenter’s Come On Come On[SBME Special Markets, 16/44.1] through a set of almost clinically revealing headphones the Pro iCAN helped draw forth the headphone’s more expressive, magical side. Chapin’s voice sounded downright luminous and seemed to float gracefully upon the air, while the backing instruments—most notably the piano and bass—sounded achingly beautiful with rich, deeply saturated tonal colours and expansive harmonics that made them sound almost breathtakingly realistic. In sum, the Pro iCAN is a versatile, powerful, accomplished, and masterful headphone amp/preamp that is ready to serve as the centrepiece of a very high-performance personal audio system.